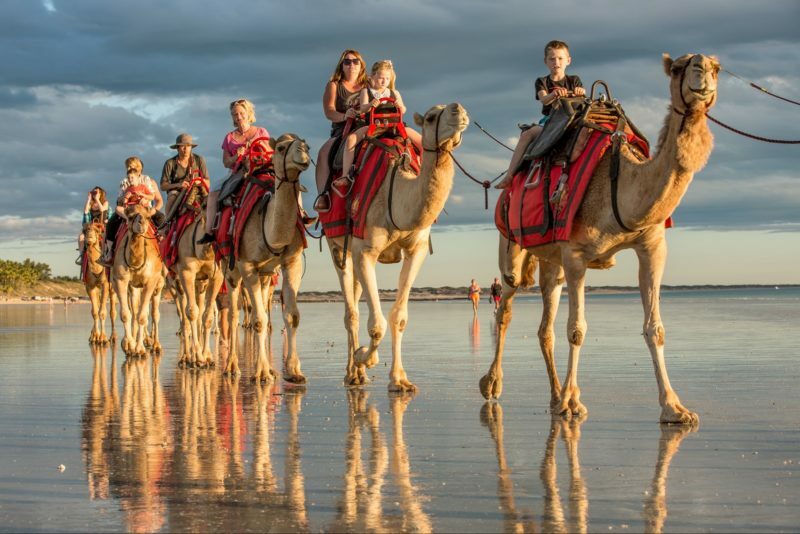 The Port Gregory Caravan Park is a beautiful, clean, family friendly park that is located an easy walk to the stunning Hutt Lagoon ‘Pink Lake’ and also an exquisite lagoon. 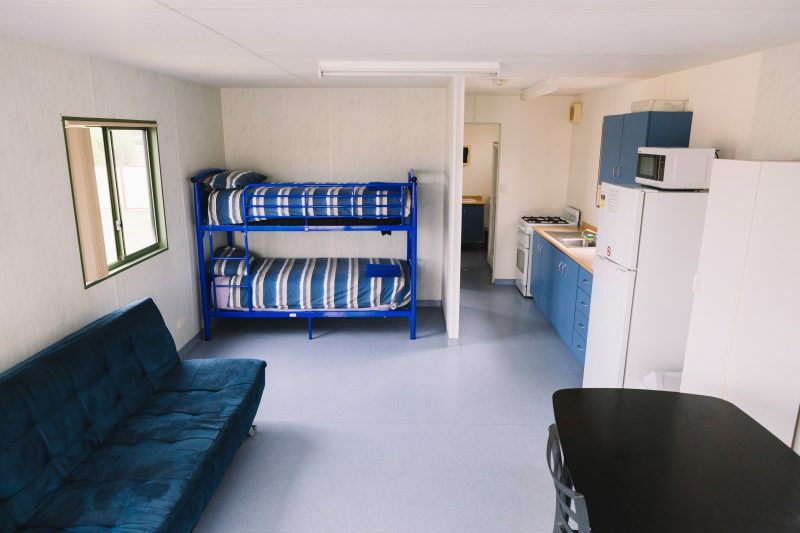 The park has a range of accommodation options available from standard and en suite cabins to powered tent sites. Pets are welcome to travel with you if you are camping and by prior arrangement when booking. There is a great recreation and barbecue area with a big screen for those important games of sport everyone likes to watch, immaculate ablution blocks and grassy sites. 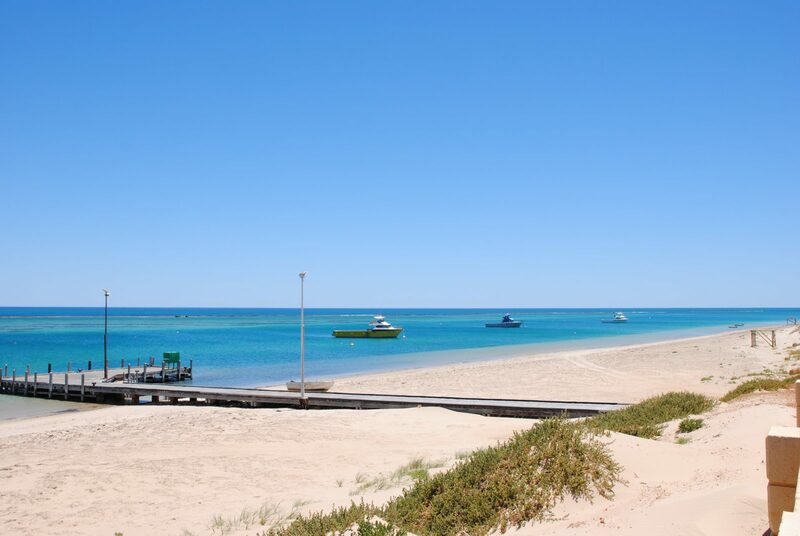 The Port Gregory Caravan Park prides itself on being a family orientated park and love also to host fishermen and travellers passing through. They are a 50 minute drive from Kalbarri where you can enjoy the gorges and sights in a day trip and stay somewhere quiet and peaceful. Some of the sites are shady, most are grassy and all are powered. This cabin is comfortable for a family. It has a queen bed in the bedroom and a set of bunks in the living area. A roll away bed can be put into this cabin to accommodate an extra person. It has a bathroom with toilet and an air conditioner. There is a living and kitchen area with oven, microwave, fridge and freezer, fry pan, kettle, toaster, cutlery and crockery. Linen is included. There is a TV with built in DVD player and a small patio. Please note, pets are not permitted to accompany you when staying in the on site accommodation. This cabin has a queen bed in the bedroom and a set of bunks in the living area. This is a smaller cabin, and so is really suited to 2 adults 2 children or 3 adults. It has a bathroom with shower and toilet, and an air conditioner. There is a small living/kitchen area with stove top, microwave, fridge/freezer, frypan, kettle, toaster, cutlery and crockery etc. Linen is included. There is a television with built in DVD player and a small patio. Please note pets are not permitted to accompany you when staying in the on site accommodation. This cabin has a queen bed in one bedroom and two single beds in each of the other two rooms. There is a kitchen and separate living area. A roll away bed can be put into this cabin to accommodate an extra person. It has a bathroom with a separate toilet and an air conditioner. The kitchen contains an oven, microwave, fridge/freezer, fry pan, kettle, toaster, cutlery and crockery. Linen is included. There is a TV with built in DVD player and a small patio. Please note pets are not permitted to accompany you when staying in our on site accommodation. This cabin has a queen bed in one bedroom and a set of bunks in a second bedroom. There is a small kitchen and separate living area. A roll away bed can be put in this cabin to accommodate an extra person. It has a bathroom with toilet and an air conditioner. The kitchen contains an oven, microwave, fridge/freezer, fry pan, kettle, toaster, cutlery and crockery. Linen is included. There is a television with built in DVD player and a small patio. Please note pets are not permitted to accompany you when staying in our on site accommodation. This room has one queen bed, a small bathroom with shower and toilet. Self contained room including linen, limited cooking facilities – microwave, fry pan, toaster and a kettle. There is a small bar fridge. Television with built in DVD player. Air conditioner and a small patio. This cabin only has one room and is more like a bedsit. Suitable for a couple only (with possibly an infant), for a short stay. Please note pets are not permitted to accompany you when staying in the on site accommodation. These cabins have no bathroom/toilet and no hot water to do your dishes. There is one Queen bed and a set of bunks. A roll away bed can be put into these cabins to accommodate an extra person if required, however it will make it tight. Self contained including linen, the cabins have a stove top, microwave, fridge/freezer, fry pan, toaster, kettle, cutlery and crockery. There is a television with built in DVD player and a small patio. You will have to use the park ablution block for your showers and toileting needs which are located near the cabins. Please note pets are not permitted to accompany you when staying in the on site accommodation. The lowest price is based on our off peak senior rate, and the highest price is for an 3 Bedroom En suite Cabin for 2 people in peak season. Peak rates apply for all school and public holidays.